Articulating a radical agenda for the rethinking of the basic precepts of the construction industry in light of digital technologies, this book explores the profound shift that is underway in all aspects of architectural process. 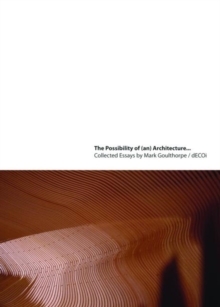 Essays and lectures from the last fifteen years discuss these changes in relation to dECOi Architects, created in 1991 as a forward-looking architectural practice. This excellent collection is relevant to architectural professionals, academics and students and also to practitioners in many related creative fields who are similarly engaged in trying to comprehend the significance of the import of digital media.